December 14, 2018 - The jaws of the Dracula ant (Mystrium camillae) go from 0 to 200 miles per hour in 15 microseconds. 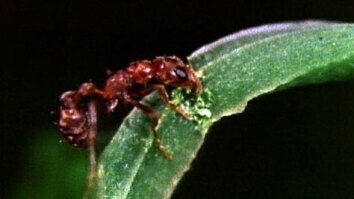 These ants can be found in the Southeast Asian tropics, Australia, and Africa. The bite has been described as the fastest animal movement on record. Its bite is 5,000 times faster than the blink of an eye, and three times faster than the previous record holder, the trap-jaw ant. This video was taken at 480,000 frames per second. Dracula ant mandibles are flattened, which allows them to bend. This mechanism acts as a loaded spring for a high-speed snap. These fast bites are thought to be used in predation or defense. The jaws of the Dracula ant (Mystrium camillae) go from 0 to 200 miles per hour in 15 microseconds. These ants can be found in the Southeast Asian tropics, Australia, and Africa. The bite has been described as the fastest animal movement on record. Its bite is 5,000 times faster than the blink of an eye, and three times faster than the previous record holder, the trap-jaw ant. This video was taken at 480,000 frames per second. 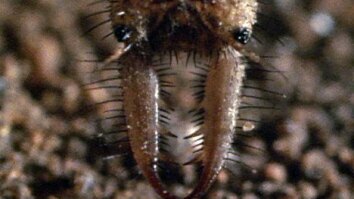 Dracula ant mandibles are flattened, which allows them to bend. This mechanism acts as a loaded spring for a high-speed snap. These fast bites are thought to be used in predation or defense.